A couple months ago, when the Essie Resort 2015 Collection came out I quickly snatched up Suite Retreat, the star of the collection. I had said that the other colour that intrigued me was Stones 'n' Roses but wasn't sure how I felt about it. 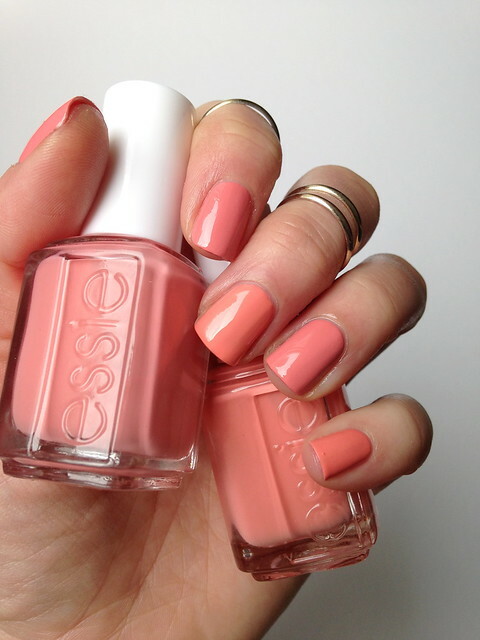 Some swatches showed it more as a peach colour and other swatches more as a dusty pink colour. My curiosity won out and I ordered it. I can finally see for myself that it is indeed more of a dusty pink colour with peach undertones. 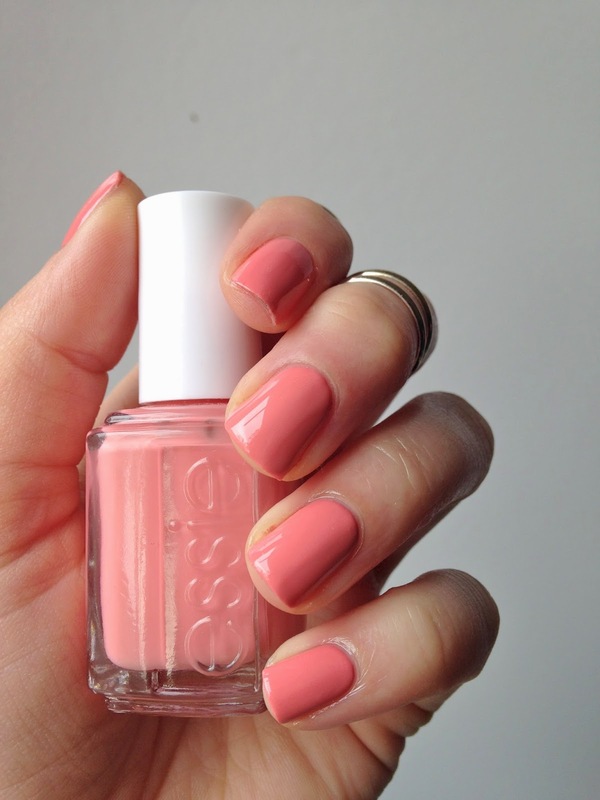 Essie calls it a "petal pink coral" which is a perfect description (why didn't I just read that before?!) The colour is pretty, but not my favourite. 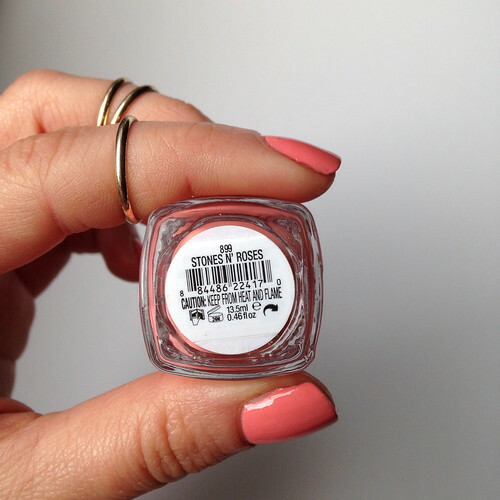 The formula is creamy and opaque and yet there is still streaking, which to me is weird. After two coats, I still had some streaky nails, so some of my nails needed a third coat. It does not self-level super well but a good top coat seemed to fix things for me. Stones 'n' Roses and Peach Side Babe are very similar and could definitely be sisters. But Stones 'n' Roses has those petal pink tones while Peach Side Babe has peach tones (go figure). The other difference between these two is their formulas. Like I mentioned, for some reason Stones 'n' Roses had a bit of streaking, but Peach Side Babe doesn't have that at all and will apply in two easy coats. I actually like both colours, but feel like I'll get more use out of the juicy peach colour this season. If you were on the fence about either of these polishes, hopefully this will help you decide which one will look better with your skin tone. So I guess my final thoughts on Stones 'n' Roses are that it's pretty but a bit underwhelming. You know what is funny though? In person, I really thought I liked Peach Side Babe better on myself, and yet when I look at these pictures I think Stones 'n' Roses is more flattering on me. What do you think? If you had to choose between Peach Side Babe and Stones 'n' Roses what would you choose? *Edited: I just posted these pics on Instagram and you guys are giving them so much love! You guys are also making me see that Stones 'n' Roses is really feminine and flattering and very versatile. My love for this colour is growing thanks to you <3.